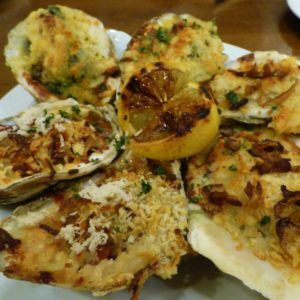 Where to eat oysters in Charleston, SC ? 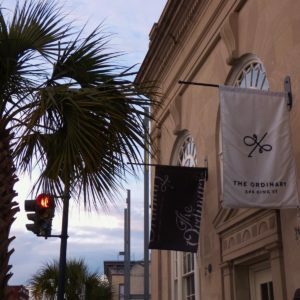 There are so many choices and you won’t go wrong very often in Charleston. But I wanted to know where to eat oysters in Charleston, SC for the very best our city had to offer. I wanted to know where to take my visiting friends and family on their precious few days in Charleston. This is the result of that search. 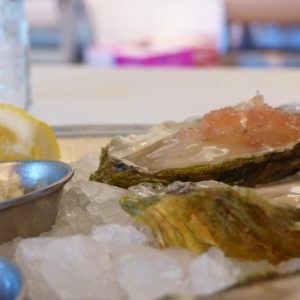 Here are the very top spots and most memorable oysters available in town right now (in this local girl’s humble opinion). First stop, a newer raw bar on Bay called 167 Raw . I walked in at lunch time and took a seat at the pretty marble bar. Everything in the case is on display and available to purchase as well. Kyle asked me what kind of oysters I liked and I told him, “All”. He inquired, “Big or little? 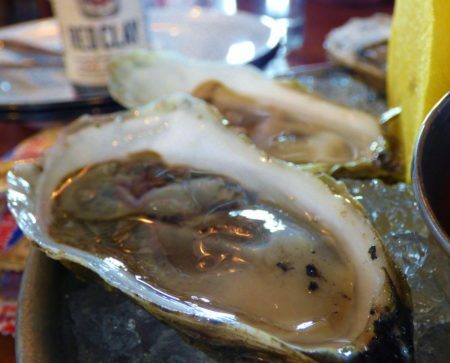 Salty or mild?” trying to pair me with my best oyster match. This day he had 7 oyster varieties on offer. “Yes, and yes” , was my unhelpful yet true response. You see, I just really enjoy oysters. I’ve never met a fresh one I couldn’t appreciate. I grew up buying them by the bushel to enjoy on the half shell along the banks of the Chesapeake. When I was younger we would often vacation on the Outer Banks of North Carolina where Awful Arthurs was our usual first stop. We would all order up a personal peck of oysters (that’s about 25 ) each. Only then had vacation truly begun. My vacations didn’t truly begin until a peck of oysters had been consumed. 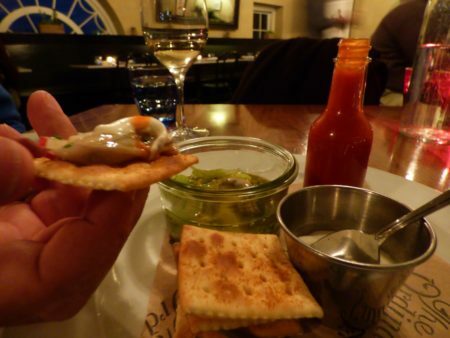 I have spent a good deal of time in France where I kicked my cocktail sauce addiction and grew an appreciation for mignonette and the briny flat beauties from Brittany. 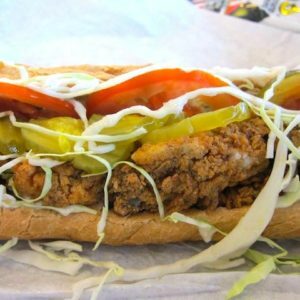 In New Orleans I discovered that I loved oysters as a late night recovery breakfast when fried up and served in a crusty Po’ Boy. And upon my arrival in the Lowcountry, I learned I also could throw down at an oyster roast. Like I mentioned before, I like oysters. 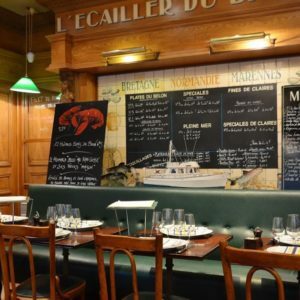 One of Paris’s many perfect oyster bars- L’Ecailler du Bistrot has flat iodine rich oysters rarely found elsewhere. An oyster Po’ Boy from Casamentos in New Orleans. So, Kyle being an agreeable sort offered up, “How about I just take a look at what we have and give you what looks best.” I also wanted to try one of their tacos so I went ahead and ordered a Crispy Oyster Taco ($6)with guacamole too. I watched the guys get to work on my order, excited to try the results. 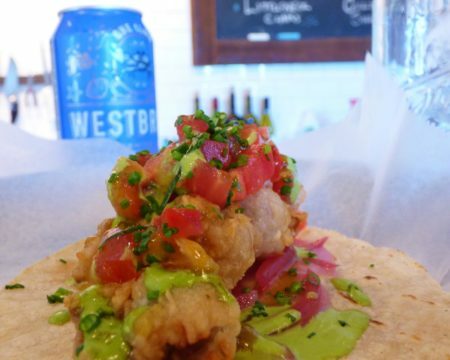 Fried Gulf Oysters served in a double tortilla with guacamole in-between and topped with fresh salsa and pickled onions. What I got was a fantastic classic raw bar experience. As good as any to be found. Expertly shucked, flipped, and iced right in front of me. Fresh horseradish grated right then, no little shell bits or sand, and no tiny fork required. That’s confident shucking. Expert shucking on display at 167 Raw Chharleston. No shells, no forks, no problem. Frozen mignonette atop a Mayflower Point oyster. Serious happy slurping followed. Cocktail sauce is served only on request here (do try at least one without it). The house mignonette was classic. And Kyle even hooked me up with a little of his shaved frozen mignonette. It gave a beautiful icy flavor without watering down the bivalves. My taco came out hot and fresh with a good quantity of crispy oysters and fresh slasa and guacamole. Delicious. I could go broke hanging out here (and that’s at a reasonable $2.50 a oyster). 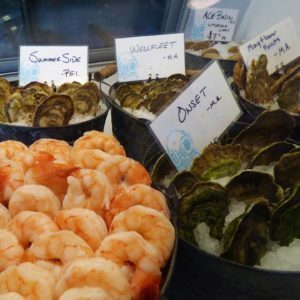 All the seafood in the display case varies and is available to bring home with you as well. In fact, the original business plan was to primarly be a market which served a little food. The menu just was so popular they had to put in more seats to meet the demand. It’s that good. I enjoyed both the Mayflower Points and the Onsets. I especially liked the shaved frozen mignonette – it was an option I’d love to see always available on the menu. A couple of days later I went in at happy hour when oysters and clams are half priced. They had a completely different selection of oysters to choose from (so great right?). The first visit selection of oysters included Mayflower Points and Onsets. 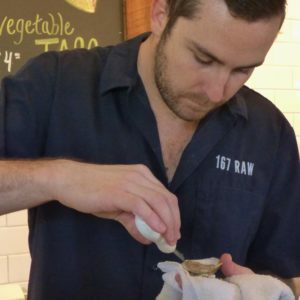 167 Raw has a friendly laid back vibe and offers tacos and choices beyond raw bar fare. 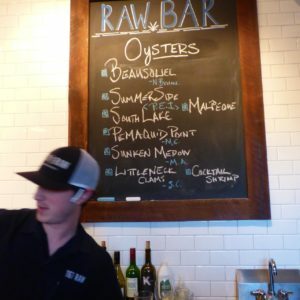 Every day 167 Raw’s oyster menu changes based on availability. Options this day included South Lakes from PEI ,which don’t show up on menus very often. 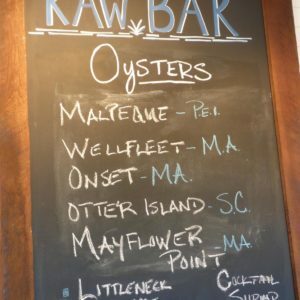 This is because they haven’t accepted new purveyors for years, but 167 Raw has a sister restaurant (of the same name) in Nantucket and is hooked up. We got a mixed dozen which included Sunken Meadows, South Lakes, and Pemiquid Points. Shown here clockwise starting at 6 in sets of 4 are Sunken Meadows, South Lakes, and Pemequids. All half price at happy hour! Although all were good, the South Lakes were I believe my favorites – nice size cup, briny but lush and balanced. I could have just sat there very happy with a personal peck. But I had to save some budget for the rest of my oyster tour. I thanked Kyle and promised to be back. Soon. In fact, I just made another New Years resolution -to become a regular here. If you are looking for a classic oyster bar experience on par with anywhere in the world, this is your go to spot. Next stop- Leon’s Oyster Shop. 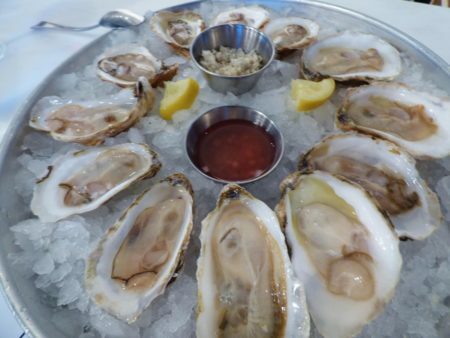 A great find on Upper King Street offers really good oyster options on the menu. 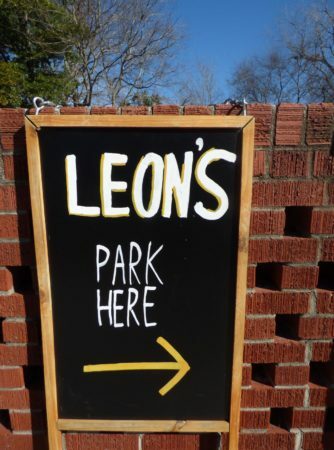 Leon’s makes creative use of its body shop past. 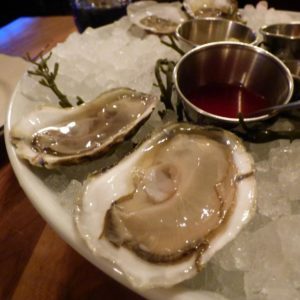 Leon’s offers an affordable house oyster as well as a high end option for more. Leon’s is that classic “joint” that you hope to find on vacation. You’ll need to drive/cab up to the newly blossoming part of town on Upper Upper King Street to dine at Leon’s Fine Poultry and Oysters. In what use to be an autobody shop is now what now my Daddy would call a “Joint”. And I mean that in the best most endearing way. Because I love a “joint”. If when you travel if you like to visit places that feel more local than tourist- you will love it here. Leon’s has a great roadhouse feel complete with jazzy blues music and a friendly and approachable menu and staff. The expertise of partners Tim Mink (think Poe’s and Taco Boy) and Brooks Reitz (formerly of FIG and The Ordinary and of Jack Rudy Cocktail Mixers) shows here. 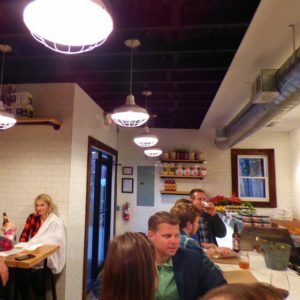 They seem to have a stellar understanding of how atmosphere, service, and a sense of place impact diners. And how really great food doesn’t always mean formal. The selection of raw oysters weren’t as varied as 167,but I liked that they had two price points. There were house or premium varieties ($1.5 and $3.5 each). 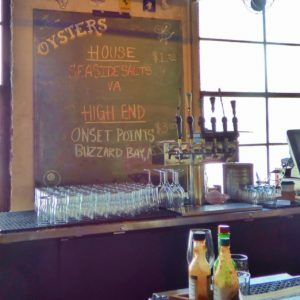 The house were a classic Chesapeake oysters- Seaside Salts and a great value at $1.5 each. 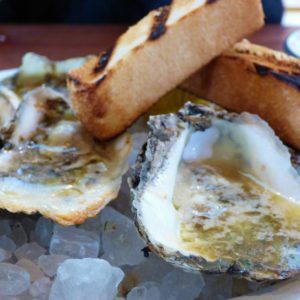 Really nice affordable oysters if you love them atop a saltine with some cocktail and hot sauce. The premiums were Buzzards out of Massachusetts. We got a half dozen of both to compare. Pictured here are Buzzard bay in front and Seaside Salts in the back. I could have easily eaten several dozen of the house oysters and been transported back in time. It was also nostalgic to find that Leon’s has a “cheap beer” section on the menu offering up options like $2 Miller Lite ponies. Oh, the family fishing trip memories supported by that tiny bottle. How it satisfy your thirst but never get hot before you could finish it. It seems perfect that they would have it here. They also have a great selection of today’s craft beers and good wine. I could have sat there eating oystes and drinking ponies for the rest of the afternoon quite happily. Wishing my Daddy were there with me to enjoy it…. But in the interest of discovery, I went ahead and got some of the Char Grilled Oysters on offer. Oh my garlicky goodness, was I happy that I did. They were buttery, fantastic and not at all over cooked. Garlic and butter invite dipping. 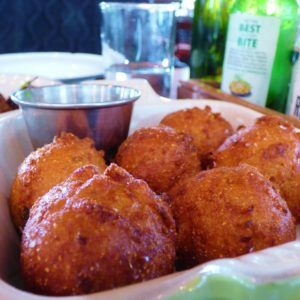 Perfect hushpuppies with honey butter make a great side dish to oysters. The oyster sandwich piled high with fried beauties, avocado, and that same hot sauce was also a clear winner. I really must recommend you get a side of hushpuppies here. Best I’ve had anywhere in town. Perfect soft moist center, crispy but not oily, and served with honey butter. You won’t regret it. I walked to the near by parking lot a very happy, very full customer. Be sure and look for their lot- free parking downtown is a real perk. This is where I’ll be bringing my Dad and brothers when they visit to enjoy some char grilled oysters, ponies and laughter. 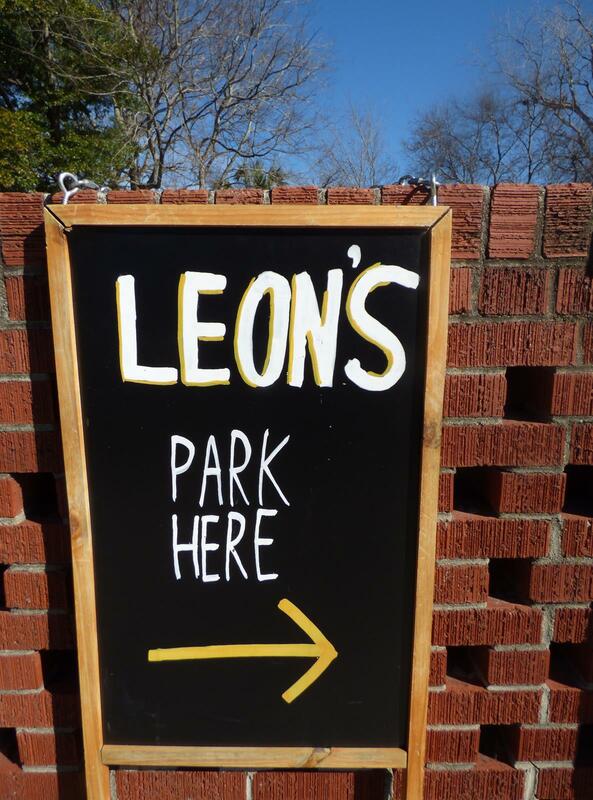 Parking is offered at Leon’s- look for the entrance before getting to Leon’s on King. In my opinion, my best and often most memorable romantic dinners have often included oysters (in season). So next, my husband and I headed to dinner at what many in the know consider to be our city’s finest restaurant- The Ordinary. This is the talented Chef Mike Lata’s baby. It is also known as one of the best oyster bars in the country. You just can’t write about oysters and not eat dinner here. Simply one of the finest restaurants anywhere. Housed in a former bank, The Ordinary is a delight for all your senses. 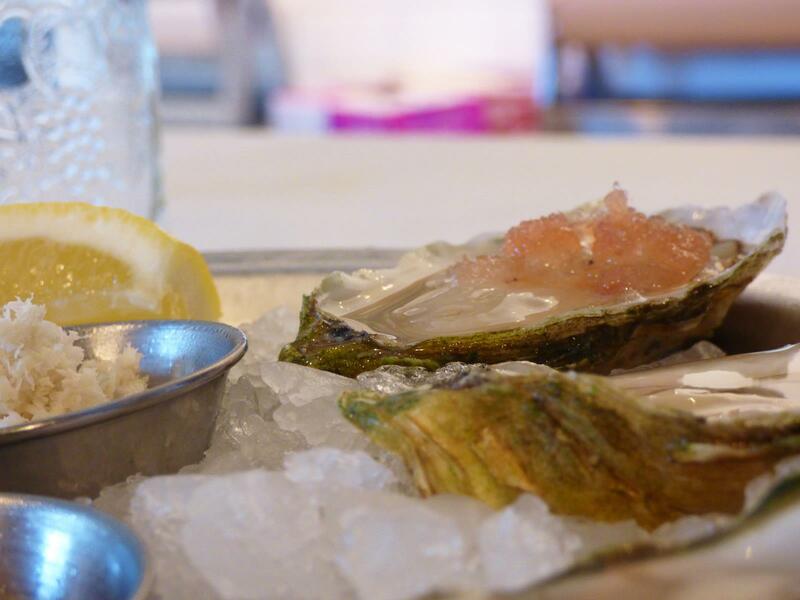 The Ordinary offers up some of the finest local oysters on the half shell available, so we started with those. 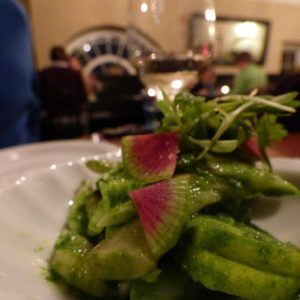 Chef Lata understands the difference locally sourced ingredients make in a dining experience. He has proven for years at his FIG Restaurant across town. In wine and food we would call this understanding “Terroir”. Chef Lata has dubbed his concept here “Merroir” – being foraged from our local waters seasonally.To that he has added the best available professionals in servers, in creating a daily beer menu, in interior design and of course suppliers. Aiming for a flawless dining experience for his customers (and hitting it on our visit).Lady Islands and Caper Inlet Blades were the locals available that night. The Ordinary offers amazing local oysters. The sign above the bar says it all. 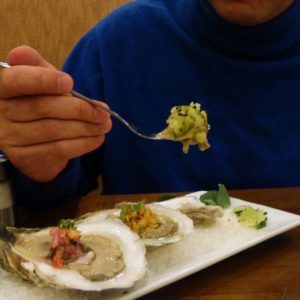 The Ordinary does offer a fun selection of sauces with a creative twist with their raw oysters. But the truth is, though I tried the delicious sauces, I found the delicate oysters were best with a small squeeze of lemon and shred of fresh horseradish. Some may say that even that was gilding the lily. Next we tried a couple of the oyster shooters. Half shells topped with cucumber water then served atop a shot of mango vodka sweetness. Good option for the first timer or fearful, but not our personal favorite of the night. 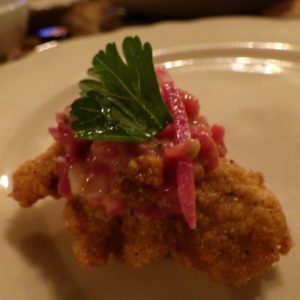 Our talented and engaging server Brittany recommended we not miss the Fried Oysters with Beef Tartare. Thank you Brittany. 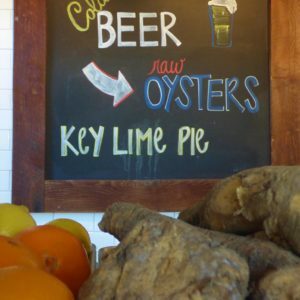 Great painless option for those wanting to try an raw oyster. A Revelation in flavor and texture. It sounded odd and was hard to imagine, but boy am I glad I listened to her. We were won over in one amazing bite. Of all the dishes in this post this is the one I never knew I loved but I am so happy I found. Inspired and unique yet oddly familiar. Crispy but with a creamy umami from the beef tartare. This is this dish that will impress any out of town “foodie” looking for a local thrill.Don’t be afraid – order it. There is a story about the origins of this dish being a mix up somewhere in Europe with Chef Lata trying to get some tartar sauce with his fried oysters and getting Beef tartare instead. Good story- might even be true. Even though we were focusing on oysters, Brittany tipped us off about ordering the razor clams with apple ,cilantro and watermelon radish. So fresh and perfectly balanced. This is one of their original dishes and you see why it has stayed on the menu. Almost reminded me of a Vietnamese flavor profile. 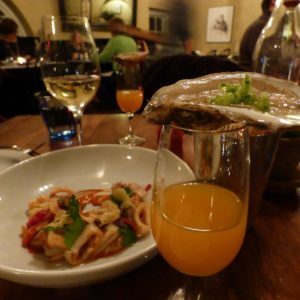 Even on an oyster post this clam dish deserves a nod. 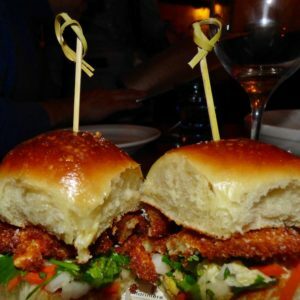 Oyster sliders on soft buttery rolls with a nod to Vietnam. Next up was the perfect spin on a oyster slider. Incredibly soft house made buns (available as a side) cradled crispy greaseless oysters with banh mi influenced pickle. And great paired with the Razor Clams. Our last (but not least )recommended oyster dish at The Ordinary was house smoked oysters. Served with an wonderful homemade hot sauce and baked saltines. Everyone gets to make their own perfect bite. Create your own perfect bite with house smoked oysters at the Ordinary. This is what I’d order at the bar by myself with a drink before dinner. Might even steal it to serve at home when entertaining.Fun and fresh but with a nod to the classic. We quite simply loved each and every dish here. But the Crispy Oysters with Tartare and the Locals on the half shelf are the dishes that beckon me back. This is where you take me to celebrate or impress someone with oysters (Is my husband reading this and making notes?). There is a reason this place has a stellar national reputation, it’s not hype. 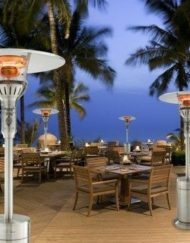 Somewhere between a joint and a world class restaurant is where most of us dine out most of the time. Which brings us to Amen Street. 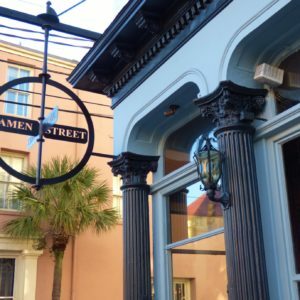 Nestled on Bay street in a historic building within the beautiful French Quarter of Charleston is Amen Street. 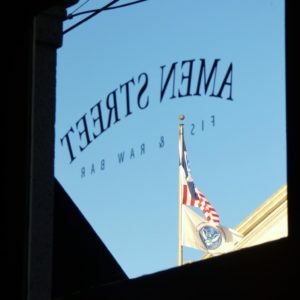 Amen Street Restaurant is located in the beautiful French Quarter of Charleston. 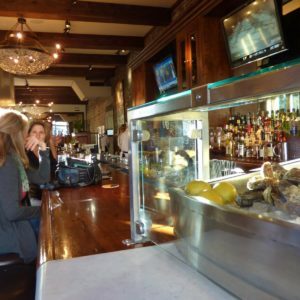 Sit at the bar to take advantage of their $9.95/doz local oyster happy hour. It’s too pretty to be called a joint and too casual to be fine dining. 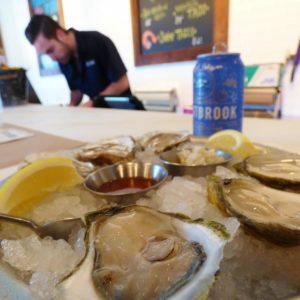 Which makes it a great place for me to recommend for happy hour or a casual meal with oysters when walking around downtown. The happy hour stand out to me was the unique affordable ($4-5) wines on tap that pair well with oysters. 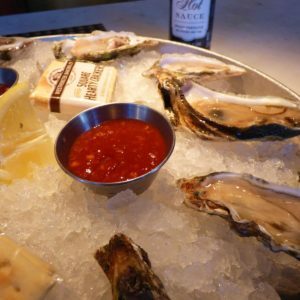 The dry Redenuff, Dry Rose of Sangiovese or the $2 Yuenglings were a great pick for enjoying with oysters on the half shell. The house oysters here are local Ace Blades and were a fresh and flavorful bargain. 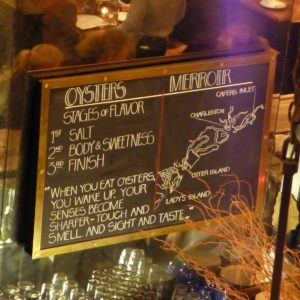 If you are looking to enjoy a dozen oysters with a cocktail without blowing your dinner budget- you will be very happy at this comfortable classy bar. 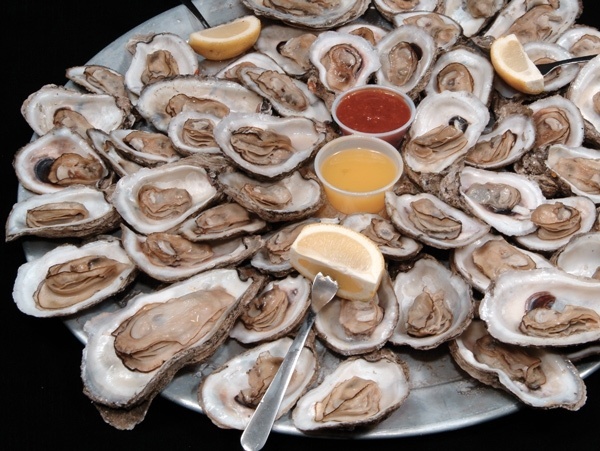 Because in Charleston, everyone can afford to enjoy local oysters on the half shell. 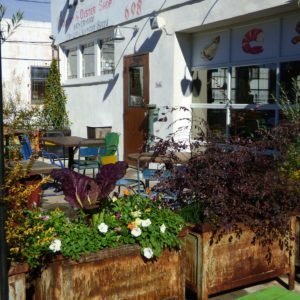 Outside of great happy hour specials, Amen Street also offers many varieties of oysters on the half shell as well as menu options like an oyster po’ boy. 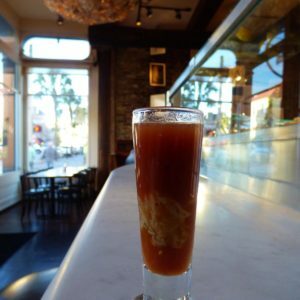 Award Winning oyster Shooters with house vodka can kick off your night. Ace Blade Oysters for $9.95 a dozen at Amen Street. Heaven. We also just love the street life on display through the big windows and the creative oyster chandeliers that add so much to the lively atmosphere. Here, it’s even possible to bring your do to enjoy some oysters out front on the sidewalk tables. The good life for sure. Sometimes the very best oyster is the one closest to you. Daniel Island, South Carolina is close to all Charleston has to offer.
. 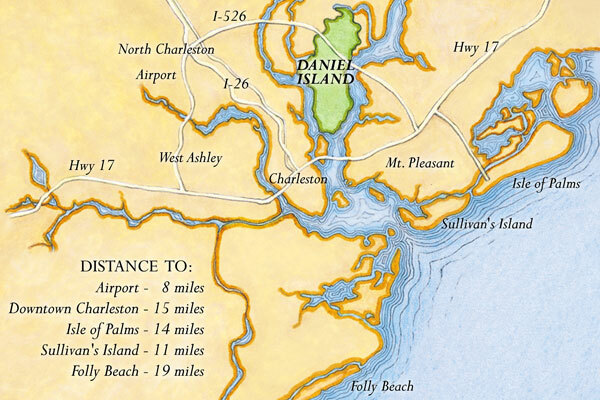 I happen to have the joyful blessing of living on Daniel Island , SC (which is technically part of Charleston but does require bridge crossings to eat everywhere I’ve mentioned so far). Sometimes a girl just gets a craving for a dozen on a Tuesday night nad there is homework and basketball practice to consider. Until about a year ago, I just had to be patient and plan a night into town soon. But now that The Islander has opened a short bike ride from my house, that has all changed. The Islander is owned by the Holy City Hospitality Group that incudes downtown favorites like Rue de Jean, Coast, and Virginia’s on King. All of which serve some oysters. But here on island we are spoiled with a multitude of bivalve choices on The Islander menu. The Tuesday I was in Chef Whisenant was working with some nice sized Chesapeakes. You can order them in everything from their naked shells to a sushi soy wrap. We started with oysters 3 ways which showcased 3 toppings of fresh salsa. I favored the tropical which had a little thai chili kick. 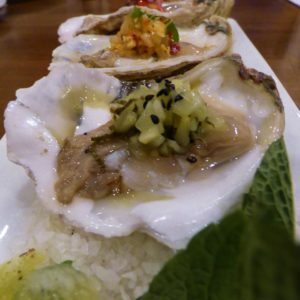 Oysters 3 Ways is a delightful start to any meal. Then we ordered the baked oysters available in three styles as well. 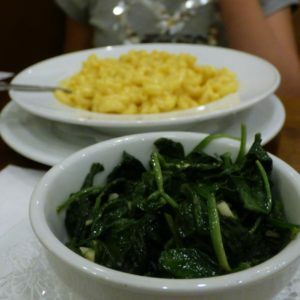 Bienville with shitakes and crabmeat, BBQ with fresh grated horseradish, and the ever popular Rockerfeller with spinach and parmesan. We decided to sample all and had different favorites among us. 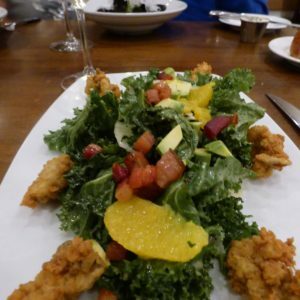 Next we got their beautiful roasted kale salad topped with crispy oysters. All the menu salads can be topped with oysters at The Islander. But the Local Kale with avocado, bacon lardons, and Chipotle Vinaigrette was a great match with the crispy oysters. The giant platter of fried oysters with jalapeno cole slaw and Rue De Jean famous frites is also a solid choice (and affordable at $16.99). 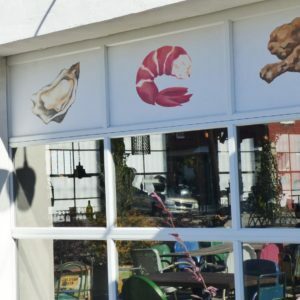 Although this is my neighborhood resource for an oyster fix, I do encourage you to make the trip to our piece of paradise to enjoy this great spot. 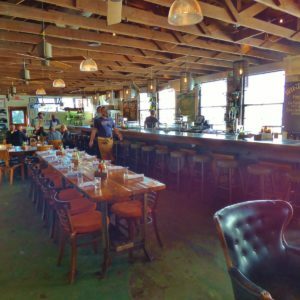 Stellar cocktails, open beachy atmosphere, and lots of fresh creative ways with seafood make it more than just a neighborhood place. Delicious offerings just a bike ride away for me. From top pictured are Rockerfeller, Bienville, and BBQ Baked Oysters-all good. Two more reasons we love The Islander- Kids Menu. And finally we have to recommend the perennially favorite for the Lowcountry oyster roast, Bowens Island Family Restaurant. This concept was new to me when I moved here. But for over sixty years Bowens has been steaming up local bivalves and creating memories.The basic idea is that most SC oysters grow in clusters and are not really suited to a half shell presentation. But they are delicious. So locals steam them up outside in burlap sacks over grates until they are just opened and then stand around eating them while drinking beer for hours. Reminds me of a crab boil in Maryland in feel and messy style. Some like cocktail and saltines- some are purists and just slurp them up. I recommend you ask for them roasted lightly so you can get at them but still preserve their juicy tenderness. Bowens Island makes for a memorable experience. 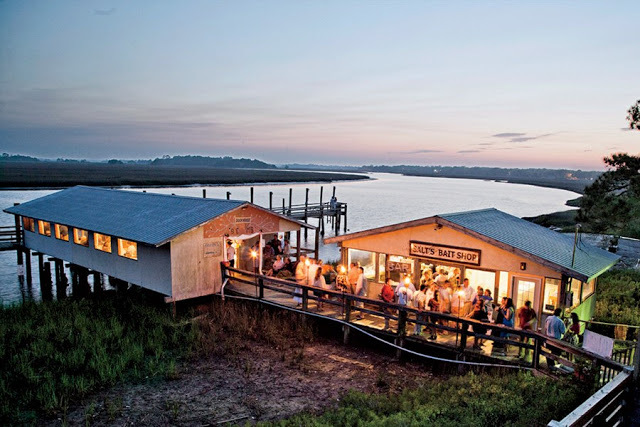 Bowens Island family restaurant is justifiably famous for their oyster roasts. Yes there are lines and its not fancy but it is all part of the experience. And I personally love the rustic charm. The giant piles of oyster shells everywhere testify. It is about a 20 minute drive outside of town towards Folly Beach, and totally worth it. You pay one price ( $23.00) then eat until you can’t possible handle another oyster. Then your roaster gives you one more shovelful and you finish it anyway. 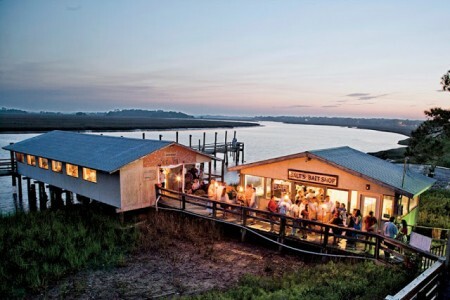 Go at sunset and bring friends for a memorable night of oysters on the marsh – local style. As I said in the beginning, this in no way covers all the great places to enjoy an oyster in Charleston. Maybe you have a local place you can ride you bike to. Or a revelation dish or fresh take on a classic. Share the wealth and comment below! 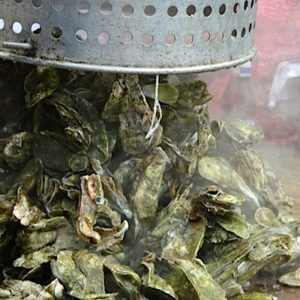 Where to eat oysters in Charleston, SC? Anywhere and as often you can I say. Thanks Angie for reading and commenting. Remember our vacation to Duck,NC that chicken pox almost stole? I actually thought of you when I had the Littleneck Clams on the half shell last week, your favorite right? Thanks for the support. 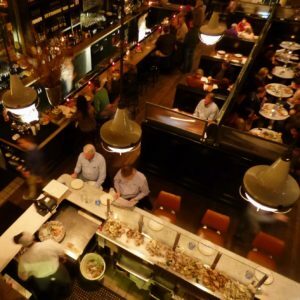 I loved learning your favorite place to have oysters, I want to try The Ordinary! I think there is no better place than having them at home. That way they are cooked exactly to perfection and I can have as many as I want (and at a really good price). 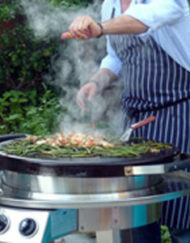 Have you ever tried steaming oysters on the EvenGlo grill? How about you Jessica? 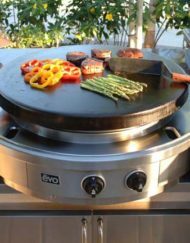 You have some great healthy recipes- any good ideas for oysters? They seem a natural for healthy eaters! On your suggestion we went to leons….so great! Thank you! I’m not sure how I’ve missed this place. So charming and great food. The house oysters were great! (Says my bro and husband) Personally I couldn’t get enough of the fish fry and hush puppies. Thanks! Call me next time you are doing research around town!! It’s such a great part of blogging- eating your way through town. So glad you enjoyed Leon’s. I’m looking at an Awendaw, SC Outdoor adventure day research you would probably love- stay tuned.